Decorative architecture and Moorish style define the distinctive Persia pattern. Striking open linework contrasts with geometric patterns, giving this Conical Bell sink its finely detailed look. A white background emphasizes the pattern yet is neutral enough to complement different fixture styles. This sink makes a dramatic, artistic statement. The Memoirs collection with Stately design draws its inspiration from traditional furniture and architectural elements. 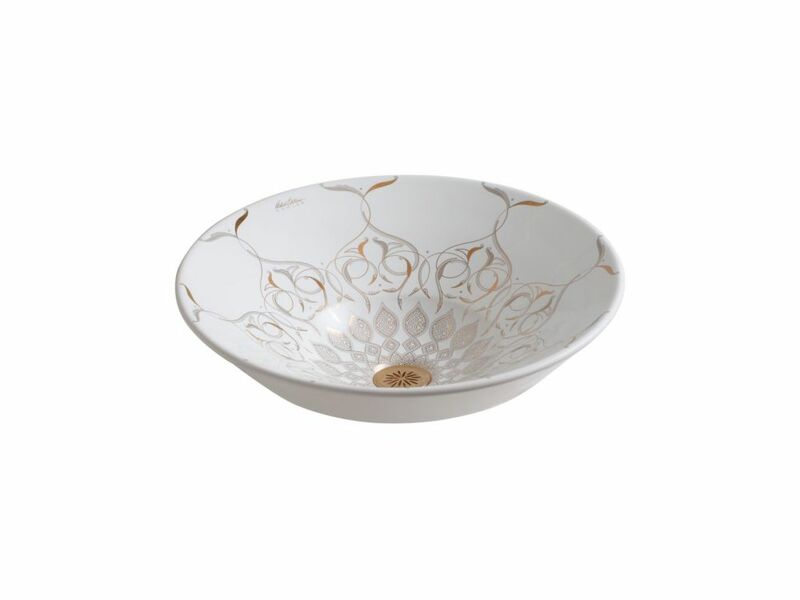 The crisp, clean lines and molded edges of this basin evoke the splendor of fine antiques. Pair this sink with the Memoirs pedestal or console table legs for a coordinated collection. Capturing the calm of a reflecting pool, the Purist Wading Pool sink offers sleek, angular lines and a shallow basin to transform your bathroom into a home spa environment. This fireclay sink adds a peaceful feeling to any bathroom with its minimalist style. Pair it with other products in the Purist collection, including the Purist porcelain hand basins. Caravan(R) Persia on Conical Bell(R) vessel bathroom sink Decorative architecture and Moorish style define the distinctive Persia pattern. Striking open linework contrasts with geometric patterns, giving this Conical Bell sink its finely detailed look. A white background emphasizes the pattern yet is neutral enough to complement different fixture styles. This sink makes a dramatic, artistic statement.